Published by: Desyllas Games, Divedice, Korea Boardgames co., Ltd.
A long, long time ago, the Monkey King was the ruler of the Mountain of the Monkeys, a Joyful and peaceful place. One day he made a great mistake: He offended the Buddha himself! As punishment, he was Imprisoned Inside the mountain where he had to stay for 500 years. While he was away, the Mountain of the Monkeys fell Into chaos. The monkeys fought and quarreled with each other and It was not a peaceful place anymore. Time passed and finally the Monkey King was freed from his prison by a famous monk, to help him on his voyage to the west. Before leaving for the Journey, the Monkey King returned to his mountain and found everything in disorder. He pondered all day: "What can I do to restore peace and Joy to my home?" Finally, he saw a few coconuts lying in a basket on the wayside and suddenly he had an idea: He gathered the two monkeys who were most fit to rule the Mountain of the Monkeys and told them: "Instead of fighting each other you will play the game of coconuts. And the one who wins, will rule In my place!" 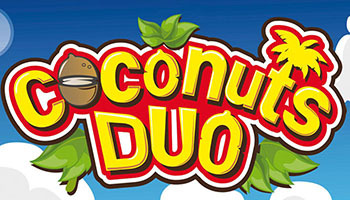 Coconuts Duo is a standalone expansion for the dexterity game Coconuts. In the game, you use your monkey launcher and your skill to fling coconuts into cups, claim them, and place them on your board. By stacking a pyramid of six cups you win the game and can claim the title of the monkey king - but beware the new powerful magic cards the other player may use. Each player takes a launcher, a player board, 2 special magic cards (shuffle the magic cards and deal 2 to each player) and distribute the coconuts roughly equally to the two players. Put the remaining components back in the box (the remaining magic cards will not be used in this game). Place the 9 cups and 2 player boards according to the following pictures.